Nimbus completed the requirements for his Working Samoyed Excellent (WSX) title. This title is granted by the Samoyed Club of America to dogs that have earned over 2,000 points in various working categories. Nimbus specialized in: sled, scooter, and skijor racing; excursion sledding and scootering; and backpacking. Nimbus (closest) is shown with Lightning on the 5-mile scooter run that finished his title. He is an incredibly hard worker and loves to run fast! In the winter of 2002-2003, our team won the International Sled Dog Racing Association 2-Dog Gig racing class. 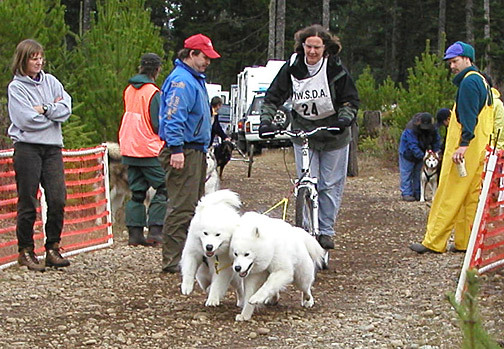 This was the first time an all-Samoyed team ever won an ISDRA class. They did it again in the 2003-2004 season! 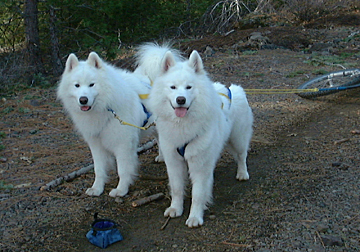 Together, Lightning (right lead) and Nimbus (left lead) won many other sledding awards. These powerful boys won the Samoyed Club of America Top Sled Dog/Sprint Team award all three seasons they raced. 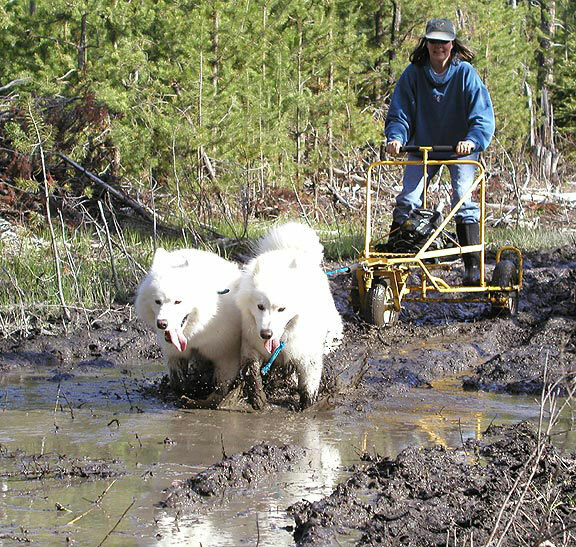 They also won the Organization for the Working Samoyed Sled Dog and Skijor awards multiple times. In 2003 our team traveled to Priest Lake, Idaho for our first race on snow. We entered the 3-Dog class, and ran it with our two boys, Lightning (right lead) and Nimbus (left lead). The other nine team ran with full three-dog teams. We finished the race in 3rd Place, averaging nearly 15 miles per hour throughout the course! 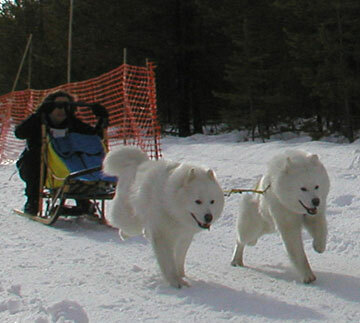 This race helped our dogs to earn the SCA Top Sled Dog award for the 2002-2003 season.